Observation - A white-flowered Campanula - UK and Ireland. 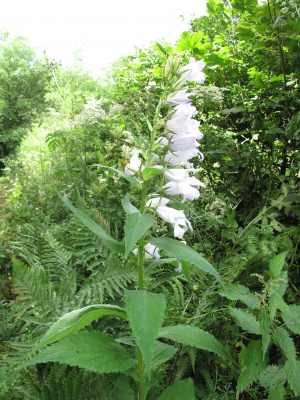 Description: A white-flowered Campanula in the hedgerow below Banks, Cumbria. I think it is probably a pale form of C. latifolia, but would welcome confirmation. I believe this species is native here, although it 'looks' like a garden escape. A white-flowered Campanula in the hedgerow below Banks, Cumbria. I think it is probably a pale form of C. latifolia, but would welcome confirmation. I believe this species is native here, although it 'looks' like a garden escape.